Germany's recently published job offer for Russian "extras" for US and NATO military drills caused vivid reaction among media and politicians. Political observer Alexander Khrolenko believes that Western armed forces are being trained "for a Ukrainian scenario." 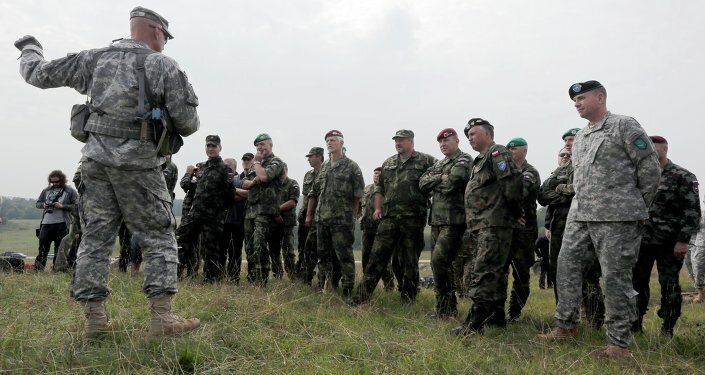 According to the expert, the exercises mean that NATO is preparing for a full-scale military conflict with Russia. "It is not difficult to guess that the Pentagon has organized training for a Ukrainian scenario, because the only ‘crisis region' in Europe, where people speak Russian, is Donbass," Khrolenko wrote for RIA Novosti. In his opinion, the Pentagon is concerned about the psychological factors servicemen may face in a war against Russians. "The simulation of the conflicts with partisan groups in large cities makes it possible to predict major problems in the area of operation that can involve the Russian-speaking population," the journalist wrote. Earlier, a job offer was published on the official web portal of Berlin on Sunday seeking Russian "role players" for North Atlantic Treaty Organization (NATO) and US Army training drills. "We are looking for performers to take part in role games during US military exercises," the website said. The starting date was said to be April 26. All participants must have a good knowledge of Russian, English and German. It would be "a great advantage" if they also know Polish or Czech, the advertisement said. "Interestingly, there are no signs of an international scandal in Germany. If Russia were recruiting American extras for military exercises, then there would be a lot of noise. But now everything is good," the expert noted. According to Khrolenko, only several activists oppose the drills. For instance, Deputy Chairman of the German Left Party Tobias Pfluger called the job offer "a disaster from the point of view of world politics." He also noted that the situation is quite dangerous and can lead to escalation given the high concentration of NATO forces deployed against Russia.